Railpictures.ca - J. Bryce Lee photo, Dan Dell'Unto coll. Photo: In late January of 1978, work was finally completed on Toronto’s new Spadina Subway extension (from St. George to Wilson Station), and it was officially opened for regular operations with an opening day ceremony on January 27th 1978. According to Transit Toronto’s Spadina extenion history page, opening day featured two trains running north and south from St. Andrew and Wilson subway stations, meeting at St. Clair West subway station where attendees were subject to speeches and a tour of the new station facilities (which included the subway platform level, and an underground bus & streetcar terminal under St. Clair Avenue). The next day, regular operations began with free rides for all passengers that day. During opening day ceremonies, we find the northbound train of new Hawker Siddeley H5′s posed at the northbound platforms of St. Clair West Subway Station, with another H5 train stopped on the southbound side (on closer observation, the number on one of the cars appears to be 5741). TTC supervisors and employees (note caps and jackets) crowd around the front end. The fellow in the brown coat with the camera is likely the late Robert McMann, who was also in attendance for the opening day. He was a well-known local TTC fan who shot many slides of the system from the early 1960′s and into the early 90′s. J. Bryce Lee photo, Dan Dell’Unto collection slide. | Railpictures.ca – Canadian Railway Photography – photographie ferroviaire Canadienne. Copyright Notice: This image ©J. Bryce Lee photo, Dan Dell'Unto coll. all rights reserved. Caption: In late January of 1978, work was finally completed on Toronto's new Spadina Subway extension (from St. George to Wilson Station), and it was officially opened for regular operations with an opening day ceremony on January 27th 1978. According to Transit Toronto's Spadina extenion history page, opening day featured two trains running north and south from St. Andrew and Wilson subway stations, meeting at St. Clair West subway station where attendees were subject to speeches and a tour of the new station facilities (which included the subway platform level, and an underground bus & streetcar terminal under St. Clair Avenue). The next day, regular operations began with free rides for all passengers that day. During opening day ceremonies, we find the northbound train of new Hawker Siddeley H5's posed at the northbound platforms of St. Clair West Subway Station, with another H5 train stopped on the southbound side (on closer observation, the number on one of the cars appears to be 5741). TTC supervisors and employees (note caps and jackets) crowd around the front end. The fellow in the brown coat with the camera is likely the late Robert McMann, who was also in attendance for the opening day. 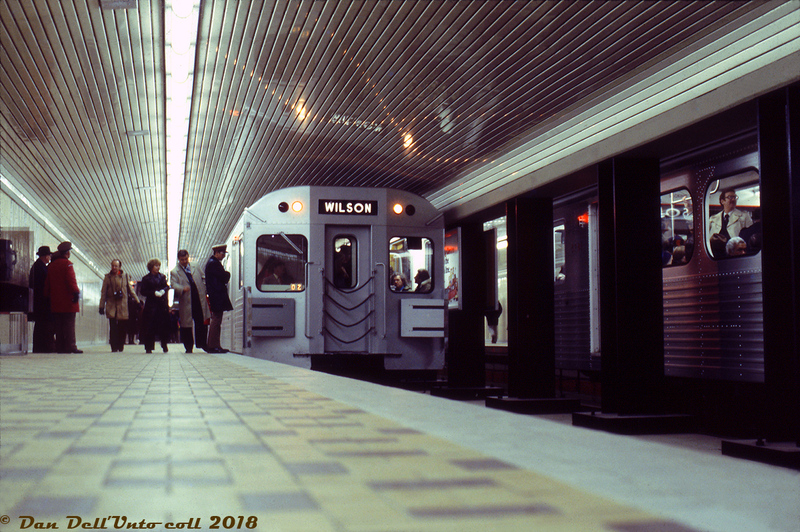 He was a well-known local TTC fan who shot many slides of the system from the early 1960's and into the early 90's. J. Bryce Lee photo, Dan Dell'Unto collection slide.